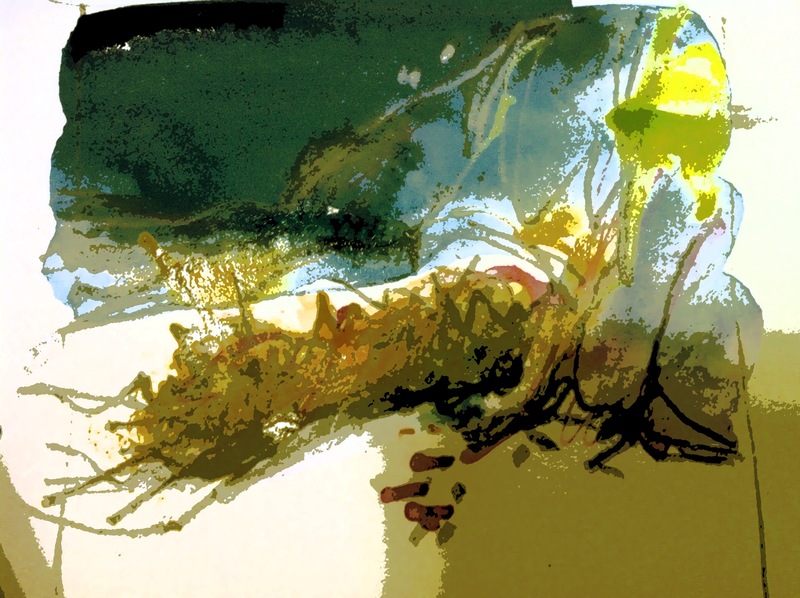 Landslip 2, 2013, (Praa Sands, Cornwall), pencil, ink, gouache, digital print. The subject is the same for both images but there are seventeen years that separate them. There is nothing new about whole chunks of cliff face falling onto the beach and we have witnessed more cliff falls than usual this winter. But as a subject that I have returned to it is interesting for me to compare these two images from different time zones in my artistic practice. The actions are the same: Landslip: a geological phenomenon which involves a wide range of ground movement. In this instance, natural erosion by the action of over-saturated ground causing the slide of a large mass of earth and rock down a cliff face to be deposited on the beach below. These cliff-falls are nothing new and we are sure to see many more in the future. Technique. The difference between these two images is that they represent differences in technique and reflect the changes that have taken place in digital technology over this time span. Landslip 1 was painted in the still relatively modern medium of plastics made by mixing polymers and pigment to produce acrylics. Once the paint is dry, (theoretically) it is not possible to undo any of the previous stages of the process. (In practice it is possible to erase some of the layers but there will be traces of paint left behind which frankly creates a very interesting surface texture). The standard way to proceed is to add another layer of paint (or drawing or whatever) on top of what is already there. Landslip 2 is a product of two key stages using different media. 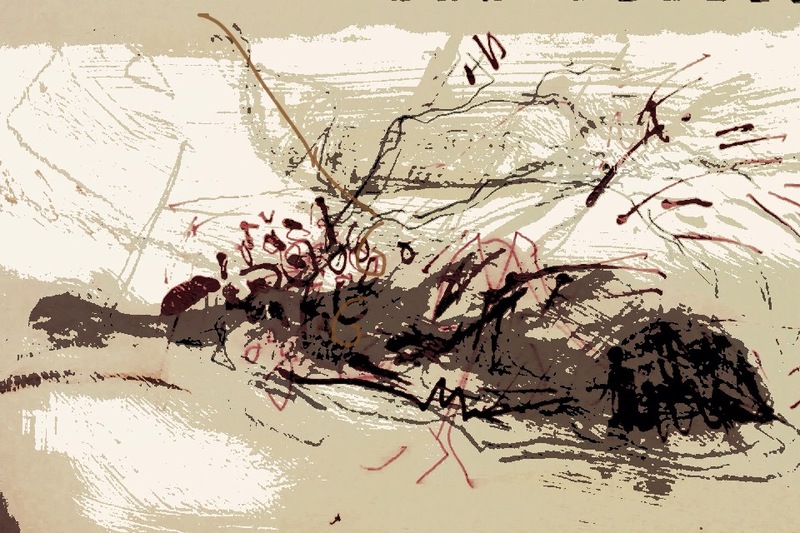 An initial drawing – using age-old, low-tech materials – carbon pencil, ink, gouache and gum arabic washes, laid onto a piece of paper primed with gesso. A digital photograph of the image was taken and then developed further within the digital arena. (In this case, the software on my iphone). At this stage, I have options. I might decide to print the image onto a piece of watercolour paper and rework back into it using my original organic materials: pencil, pen, washes of colour, oil resist etc. The real difference is that I can digitally record certain stages along the way which means it becomes a much more flexible process. I am able to go back to any of these steps that I have saved and rework them. Copyright. 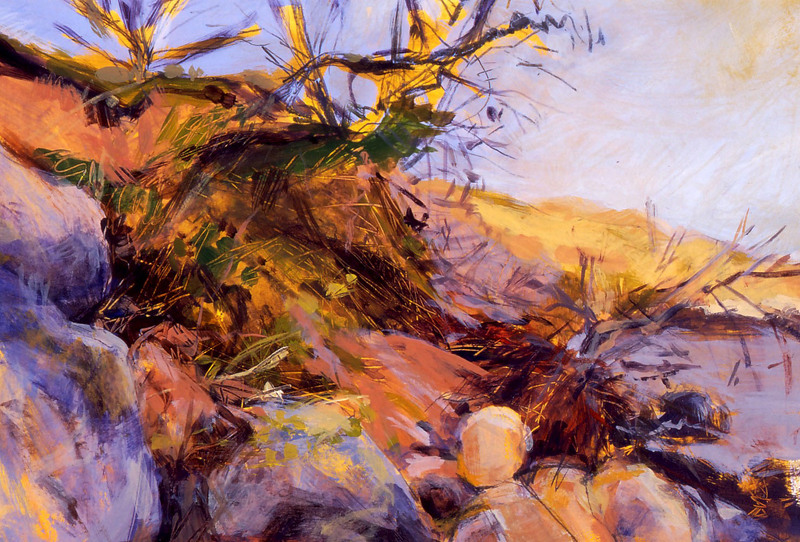 By the same token, although I no longer own the original Landslip 1 (painted in 1995), I could take the photographic record I have of it (or any other come to that) and ‘re-work’ it digitally into another artwork because as the creator, I still own the copyright. 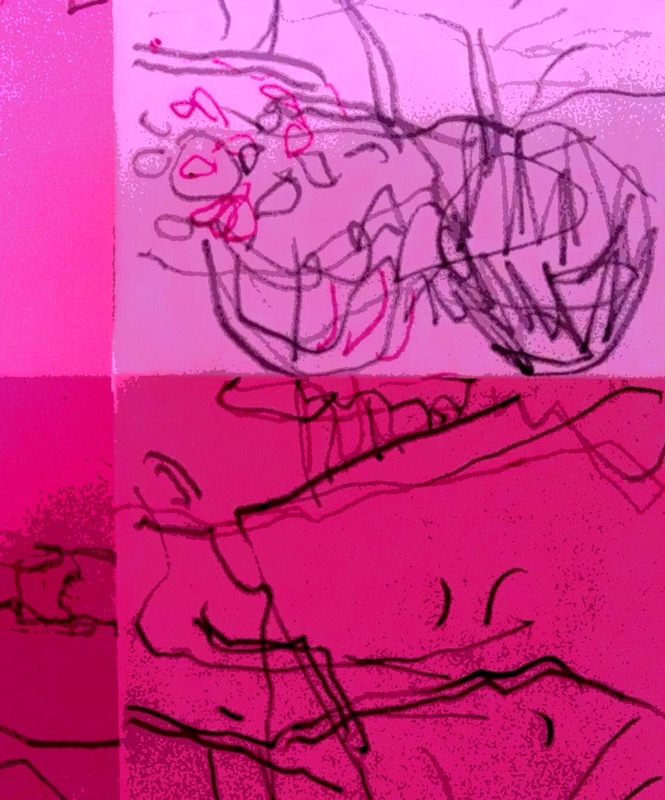 However, ever since I started the digital experiment I have pondered where exactly does it fit into my practice? If I have produced a piece of artwork using digital software somewhere in the process, is it still art? At first, I found it hard to accept that it was art. But of course, the answer is undoubtedly yes! I have creative control over all the processes. The idea is conceived by me, the facilitator, I make the decisions and it is all my own work. Phew! David Hockney did it so it must be OK. The sentiments are the same: I, me, the artist, am a silent witness. A witness to the natural destruction of localised, unstable land-forms. A witness to order turned into chaos: the reshaping of the landmass in the natural process of erosion. A witness to the danger of its unpredictable nature which can cause death to human life. I can see the layers of history once safely locked in the subsoil strata now a darkly-spewed stain on the beach. Branches and roots, ripped from their beds, now lie exposed like bare, bleached bones, the process of buffering and polishing already begun by the pounding of the sea and the sand. I watch as it becomes part of the ebb and flow rhythm of the beach until finally, consumed by the mighty ocean, there is nothing left to see. The landslip thus becomes a mere snapshot of time in motion and I am here to witness it. I was there seventeen years ago, another place another time, and I am here now. It is just part of a normal cycle of nature. Nothing has changed except my means of expressing it. 3 replies to Marking Time.